China is coming. And the numbers prove it. The rise of the Asian country’s spending power in the transfer market is hardly a secret, what with audacious plots to steal some of the globe’s most exciting talent becoming a daily staple in the football pages. But the true extent of the Chinese Super League’s rapid ascent from wannabe world power to bona-fide member of the elite is underlined in big, bold, black ink by a recent FIFA transfer report. 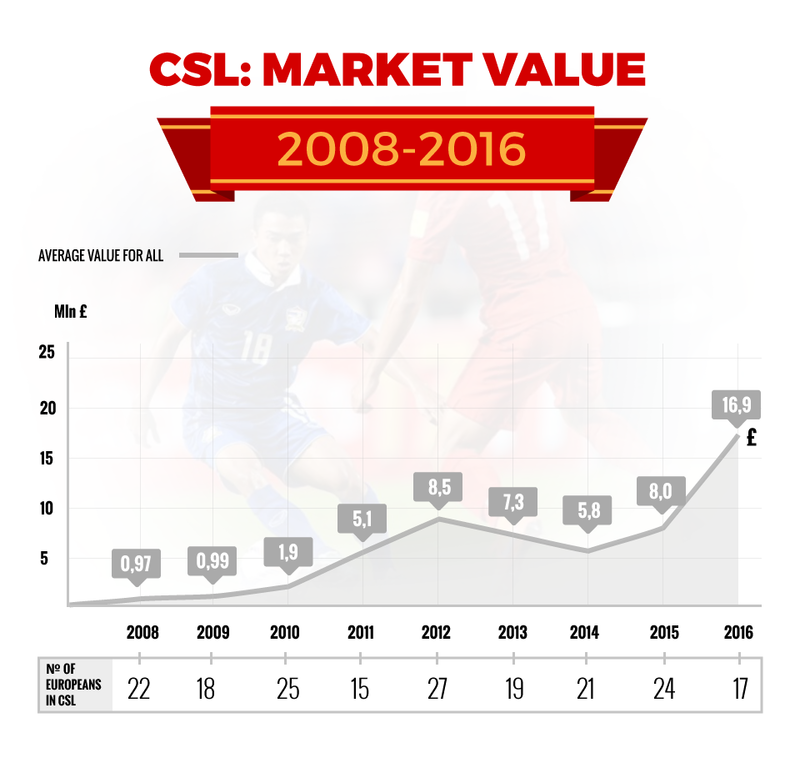 Chinese clubs’ overall spending on transfers in 2016 – a whopping $451.3million – was lower than only four other football associations worldwide. It was more than double its nearest competitor – France, whose outlay was $207.7million – and rose an incredible 168.2 percent year-on-year. The arrivals of the likes of Hulk, Oscar, Ramires, Axel Witsel, Graziano Pelle and Alex Teixeira, either leaving big Europeans clubs or turning them down in favour of a switch to the Orient, have made the rest of the footballing community sit up, take notice and, albeit privately, begin to worry. When it came to net spend, only English teams – who shelled out more than $1billion – sat above Chinese sides. In Asia, the nearest country in terms of overall spend was the United Arab Emirates. Their bill? Just $29.8million. The gap is ludicrous. This Tuesday is transfer deadline day in the UK and for much of Europe, and a few late deals will undoubtedly be done. But China get much longer – their window closes on February 28 – and their spending will get greater. Their ambitions to be on a par with the Premier League, La Liga and the Bundesliga will only grow and grow. Their brazen pursuit of English-based players shows no signs of relenting. Zlatan Ibrahimovic turned down £1million a week, Wayne Rooney rejected advances from Shanghai SIPG worth £75million over three years, Yaya Toure opted to stay at Manchester City instead of pocketing £577,000 from Jiangsu Suning. And the list goes on and on and on. China’s President Xi has a 10-year plan to double the size of his country’s sporting economy. Its roots are in both private and public investment and, just two years in, progress is substantial. The FIFA figures released this week show that only one other football association worldwide saw its spending increase more – Russian clubs spent 338 percent more on international transfers in 2016. Yet, at the same time, China doesn’t come anywhere near the top 15 when it comes to receipts for players sold. Money is being pumped in with a medium and long-term future in mind, not for immediate profit. The past two years have been a statement of intent… those statements are only going to get louder. United Kingdom Independence Party Odds – Will Nigel Farage become the next leader?